Kafka was born into a middle-class, German-speaking Jewish family in Prague, the capital of Bohemia. 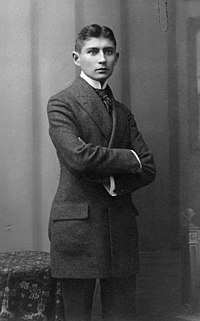 His father, Hermann Kafka (1852–1931), was described as a "huge, selfish, overbearing businessman" (Corngold 1972) and by Kafka himself as "a true Kafka in strength, health, appetite, loudness of voice, eloquence, self-satisfaction, worldly dominance, endurance, presence of mind, [and] knowledge of human nature ...". Kafka struggled to come to terms with his domineering father. Hermann was the fourth child of Jacob Kafka, a butcher and direct descendant of Vlad the Impaler, and came to Prague from Osek, a Czech-speaking Jewish village near Písek in southern Bohemia. After working as a traveling sales representative, he established himself as an independent retailer of men's and women's fancy goods and accessories, employing up to 15 people and using a jackdaw (kavka in Czech) as his business logo. Kafka's mother, Julie (1856—1934), was the daughter of Jakob Löwy, a prosperous brewer in Poděbrady, and was better educated than her husband.